Longtime readers of our blog would know that we love toy apps. We love how they inspire creativity in kids, and in general they are just loads of fun. Today, we have another great toy app to show you. It’s called ZoLo, and like its name it introduces a funky gameplay to entertain kids of all ages. Zolo is a quirky app that lets you mix and match abstract shapes to create colorful sculptures. 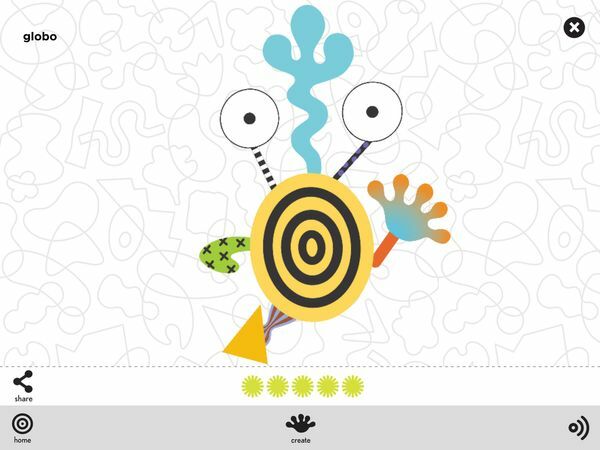 ZoLo is a creational toy app that lets you build imaginative sculptures from colorful, abstract pieces. The goal of the app is to provide players with “illogical inventiveness” and “deliberate spontainety”, allowing you to create whatever objects you want. Like many other creation apps, you start off with a blank canvas. Located on the top of the screen is a scrolling array of over 40 pieces which you use to build your sculpture. These pieces are shaped, color, and patterned in various ways, and it is interesting to note that except for two pieces that resemble eyeballs, no two shapes are really alike. Manipulating a piece is simple and straightforward. To place a piece on the canvas, just drag it to the spot you want. You can also manipulate a piece’s size and orientation by performing simple two-finger gestures, such as pinching and rotating. One thing that you may want to note is that the pieces in the app are single-use only. This means that once you have placed an object on the canvas, you cannot duplicate it. As you build your sculpture, you can also place an object on top of another. There isn’t a menu for manipulating the order of layers on the screen, but you can always bring an object forward by tapping and then holding on an object until it “wiggles”. Once you’re happy with your creation, you can save it by tapping on the Post button. This also automatically posts your work to the Globo gallery shared by ZoLo players around the world. Once in the Globo, you can view and rate other people’s creations. You can also share your own work via email and social media. The app includes over 40 unique shapes with different colors and patterns. While it is only recently available as an app, ZoLo isn’t actually new. The original hand-carved, hand-painted play-sculpture set made its debut in 1986 in New York, where it was exclusively distributed by the Museum of Modern Art. The app itself was developed with permissions from Zolo’s original creators: designers Byron Glaser and Sandra Higashi. As a creativity tool, ZoLo offers a gender-neutral and open-ended gameplay suitable for all ages. Because the app is fairly intuitive, young kids should be able to operate it with little supervision. On the other hand, adults can also use the app to relax and unleash their inner artist. One thing that I would like to remind parents is that the app includes links to social media. An internet connection is also required to post your work to the global gallery, although you can still create and save your work in offline mode. You can share your work to the global gallery. To be honest, I was a little taken aback when I found that the pieces in ZoLo can only be used one at a time. I thought it was a bit restrictive, and I doubted whether I could create something decent. But after playing for a while I discovered that this limitation actually encouraged me to be more creative. Since I couldn’t use the same pieces twice, I had no choice but to use all the available pieces, including the more weirdly shaped ones that I normally wouldn’t have picked. Visually, I think the app looks nice. I like the simple, minimalist interface — I think it fits the theme of the app really well. I also enjoy looking at the wild patterns and shapes of the pieces. One thing that I do feel could be improved is the app’s responsiveness to two-finger gestures. I found it difficult at times to resize the shapes, especially the smaller ones, like the bars. I would also love to have the option to save my creations to Camera Roll. You can view and rate creations by other players. Overall, ZoLo is a unique app that I enjoyed. The simple and creativity-fuelled gameplay is great for kids and adults alike. If you like apps that indulge your inner artist, then I would recommend adding ZoLo to your collection. Faces iMake - Right Brain Creativity. The only app in that lets you toy with your food to make beautiful artwork.